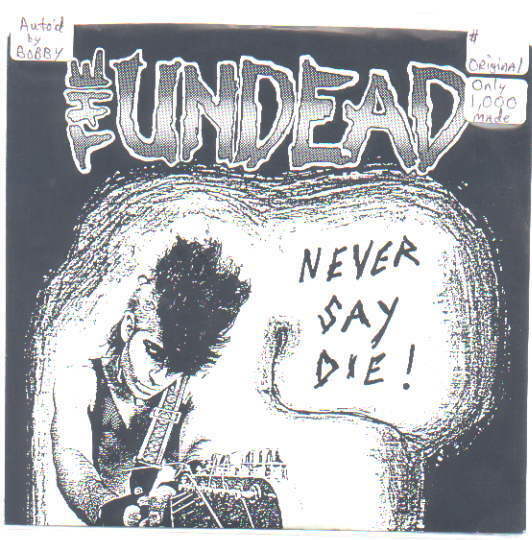 THE UNDEAD Promo Poster for "Never Say Die" 45 record! Size is 17"x25". From my personal collection. The real thing. 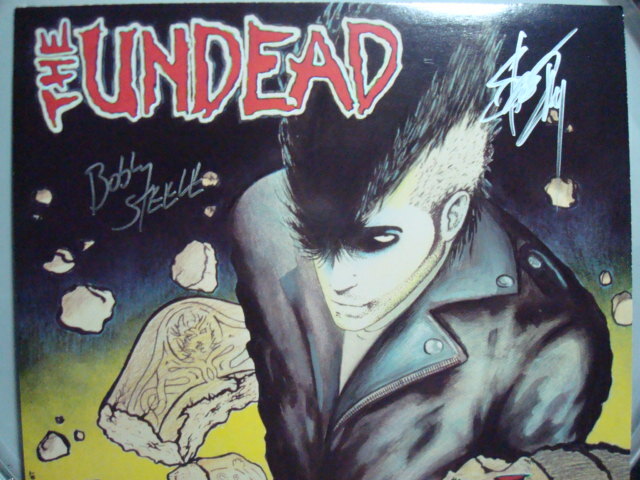 It is AUTOGRAPHED by BOBBY STEELE in Black marker! 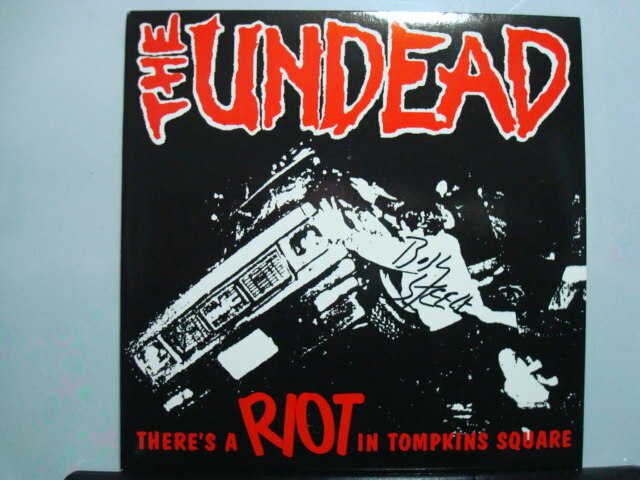 THE UNDEAD / TIMES SQUARE split 45 record of "Undead" & "Bullet" b/w "Hipocritic Liberal" & "42nd Street" on BLACK vinyl. ORIGINAL pressing. From 2000 on Transparent Records label. Only 700 MADE! THE UNDEAD / TIMES SQUARE split 45 record of "Undead" & "Bullet" b/w "Hipocritic Liberal" & "42nd Street" on WHITE vinyl. ORIGINAL pressing. From 2000 on Transparent Records label. Only 100 MADE! THE UNDEAD / TIMES SQUARE split 45 record of "Undead" & "Bullet" b/w "Hipocritic Liberal" & "42nd Street" on CLEAR vinyl. ORIGINAL pressing. From 2000 on Transparent Records label. Only 200 MADE! COMPLILATION 45 record featuring THE UNDEAD "Shadows" on black vinyl. ORIGINAL pressing. From Germany on Ox label. Front cover is AUTOGRAPHED by Bobby in black sharpie! 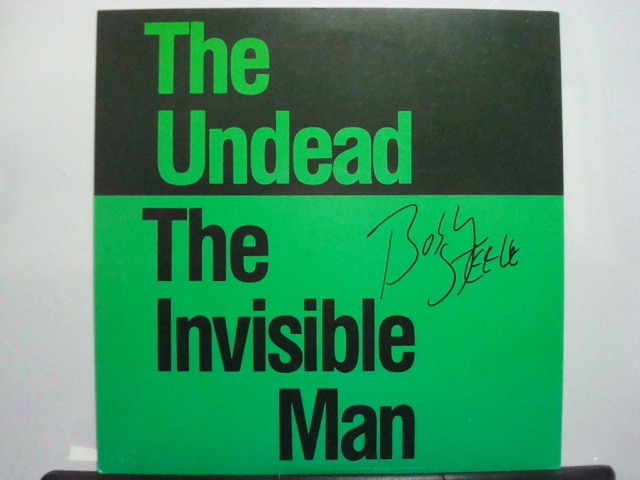 THE UNDEAD 45 record of "Invisible Man" b/w "Elected" on CLEAR vinyl. ORIGINAL pressing of this 7" record featuring Bobby Steele. From 1992 on Screaming Skull label. Front cover is AUTOGRAPHED by Bobby in black sharpie. Only 3,000 MADE! COMPLILATION 45 record featuring THE UNDEAD "The Way We Behave" on CLEAR vinyl. ORIGINAL pressing. From 1990 on Shredder Records label. Front cover is AUTOGRAPHED by Bobby in silver sharpie! 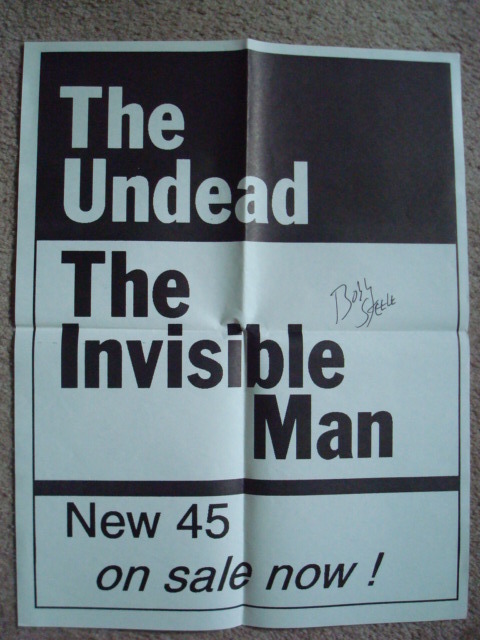 THE UNDEAD Promo Poster for "The Invisible Man" 45 record! From 1992. Size is 17"x22". From my personal collection. The real thing. It is AUTOGRAPHED by BOBBY STEELE in Black marker! THE UNDEAD 45 record of "There's A Riot In Tompkins Square" b/w "Put Your Clothes Back On (live)" & "I Want Your Dead (live)" on black vinyl. ORIGINAL pressing of this 7" record featuring Bobby Steele. From 1993 on Overground Records label. Front cover is AUTOGRAPHED by Bobby in black sharpie. UNDEAD original album LIVE SLAYER on Cassette! Cover is AUTOGRAPHED by BOBBY STEELE in silver! THE UNDEAD "Live Slayer" Original LP from USA 1991. On Skyclad Records label. On CLEAR PURPLE Vinyl - Only 2,000 MADE! Front cover is Autographed in black sharpie by Bobby Steele! LP version contains 2 extra songs ( All You Need Is Love & RATT Fink ) not on the CD or Cassette. 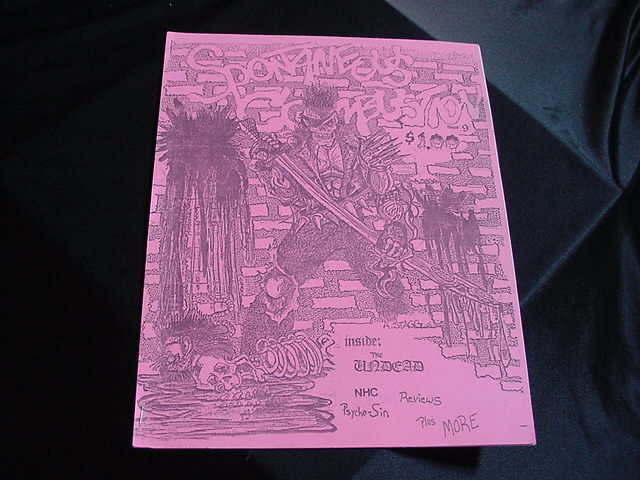 THE UNDEAD appearance in SPONTANEOUS COMBUSTION issue #9 Fan Zine, from the early 90's. 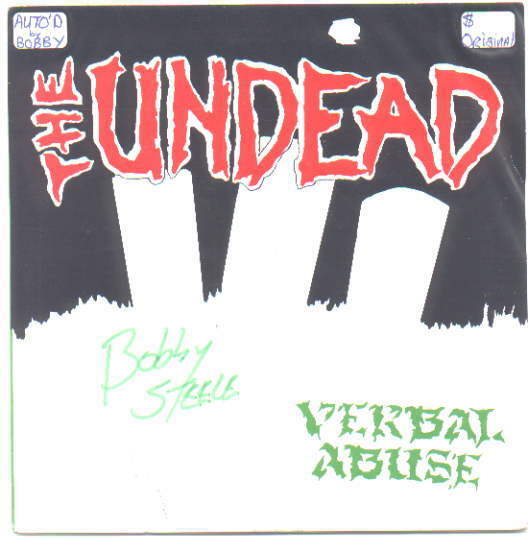 THE UNDEAD 45 record of "Verbal Abuse" b/w "Misfit" on black vinyl. ORIGINAL pressing of this 7" record featuring Bobby Steele. Vinyl is clean, just a little warped. Does not skip when I play it on my turntable. From 1983 on Post Mortem label. Front cover is AUTOGRAPHED by Bobby in black sharpie. Slight ring wear on cover. Only 2,000 MADE! Hard to find!! I bought this from Bobby himself in 1990 (he also sold me a test pressing of this release too). The UNDEAD "Act Your Rage" 12" vinyl PROMO cardboard FLAT - from 1989. It is Autographed by BOBBY STEELE & STEVE ZING in silver marker! 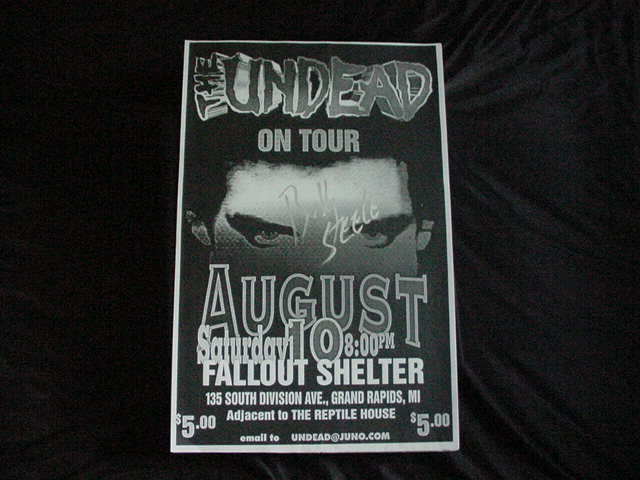 UNDEAD original Grand Rapids, MI Gig Poster! It is AUTOGRAPHED by BOBBY STEELE in silver! Size is 11"x17". 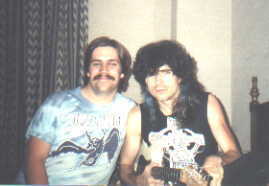 Bobby Steele and Skeeter 8-20-89 Blondies, Detroit, MI. THE UNDEAD 45 record of "Never Say Die" b/w "In Eighty Four" on black vinyl. ORIGINAL pressing of this 7" record featuring Bobby Steele. Great condition from 1985 on Post Mortem label. Back cover is AUTOGRAPHED by Bobby in black sharpie (a little smudged by him). Only 1,025 copies MADE! Hard to find!! I bought this from Bobby himself in 1990 (he also sold me a test pressing of this release too). 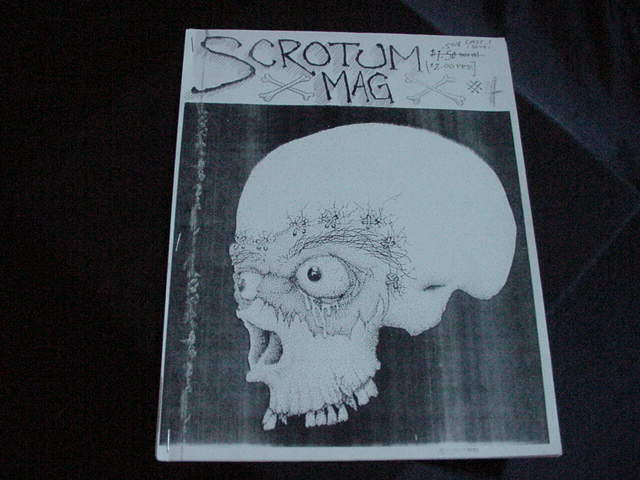 THE UNDEAD appearance in SCROTUM MAG Fan Zine, from the 90's. 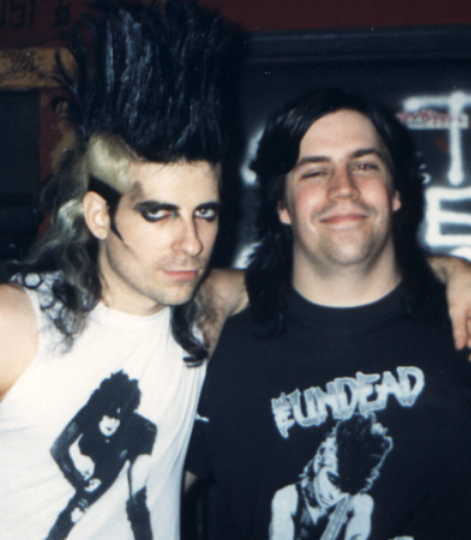 Skeeter & Bobby Steele of the UNDEAD 7-1-90 Detroit. 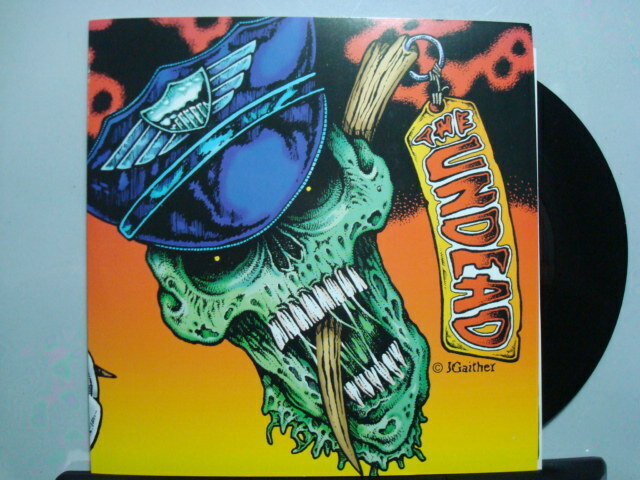 THE UNDEAD 12" LP record "Til Death!" on CLEAR YELLOW vinyl. ORIGINAL pressing. 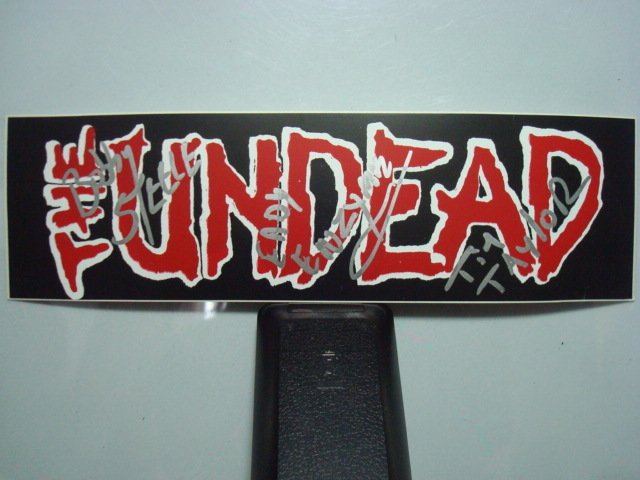 THE UNDEAD 12" LP record "Til Death!" on CLEAR GREEN vinyl. ORIGINAL pressing. 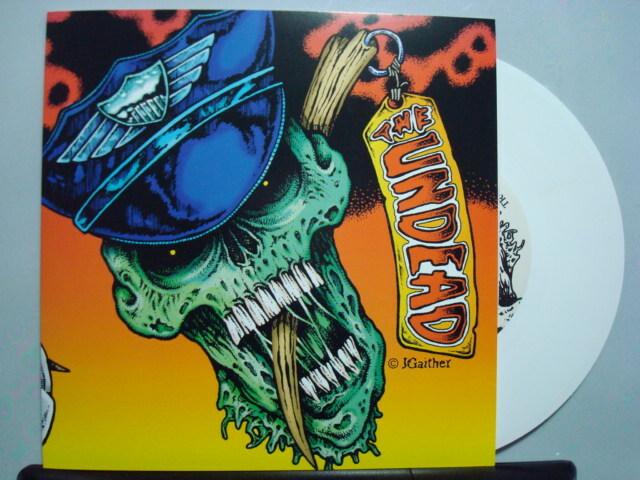 THE UNDEAD 12" LP record "Til Death!" on CLEAR RED vinyl. ORIGINAL pressing. 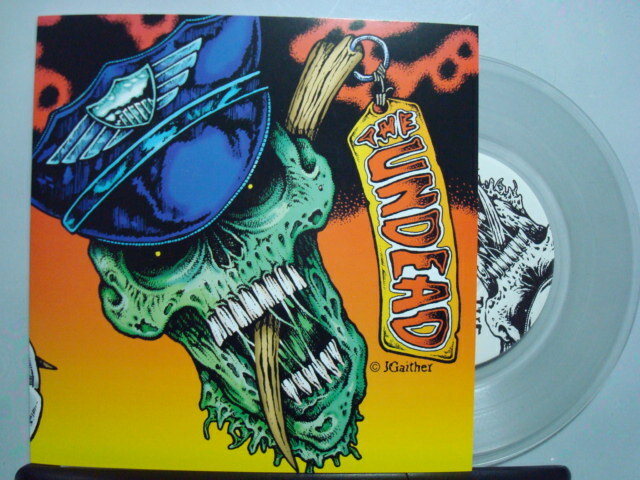 THE UNDEAD 12" LP record "Til Death!" on CLEAR BLUE vinyl. ORIGINAL pressing. 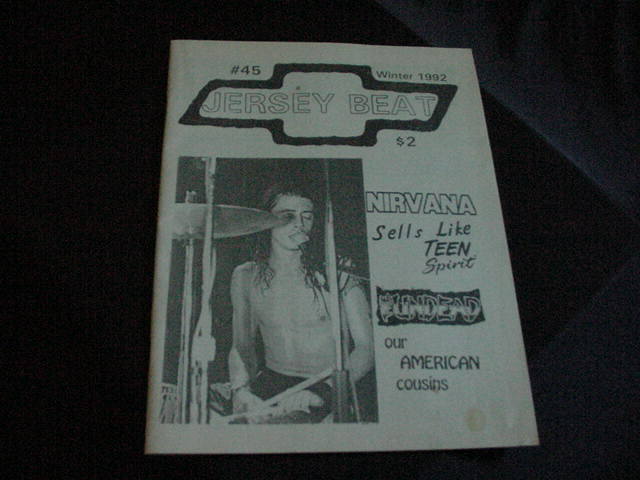 THE UNDEAD appearance in JERSEY BEAT Fan Zine, from Winter 1992. 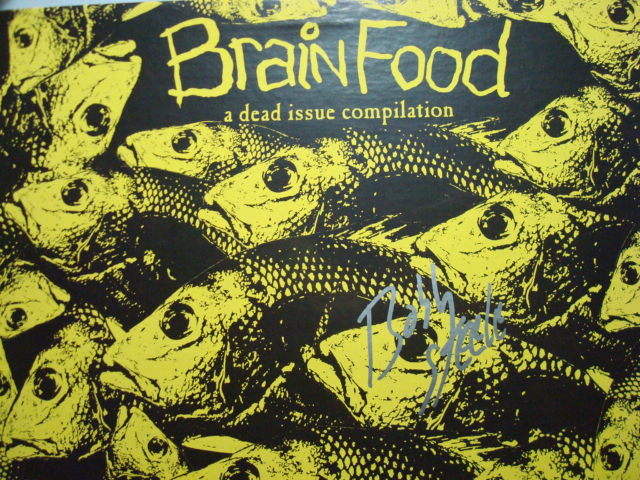 THE UNDEAD appearance on the 12" LP compilation record "Brain Food" on black vinyl. ORIGINAL pressing. Front Cover is AUTOGRAPHED by Bobby Steele in silver marker! 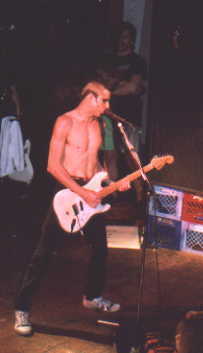 Bobby Steele live with the UNDEAD 7-1-90 St. Andrew's Hall, Detroit, MI (Skeeter standing in the shadows). 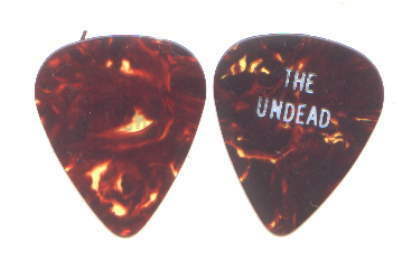 THE UNDEAD Guitar Pick. Just like the ones used by Bobby Steele on stage! It's a brown shell color pick with white printing on 1 side. 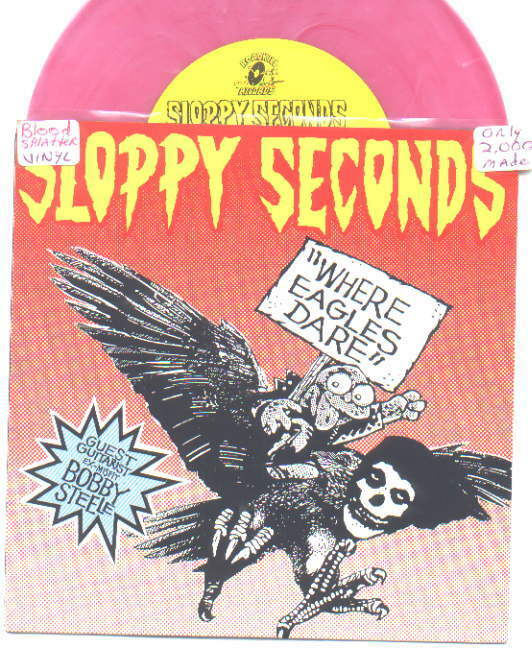 SLOPPY SECONDS record "Where Eagles Dare" b/w "Ice Cream Man" on Blood Splattered PINK Vinyl. Features Bobby Steele (playing guitar & singing) on the title track! Great condition. From USA on the Roadkill Records label 1990! Hard to find!! 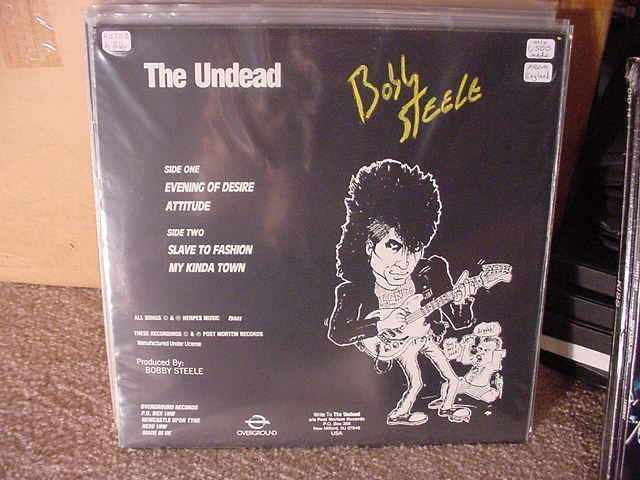 The UNDEAD "Evening Of Desire" 12" vinyl 4 song EP - Overground Records from England. Cover & vinyl are mint & never played! Rare out of print limited pressing. ONLY 1,500 COPIES MADE! Back cover is Autographed in yellow paint pen by BOBBY STEELE! 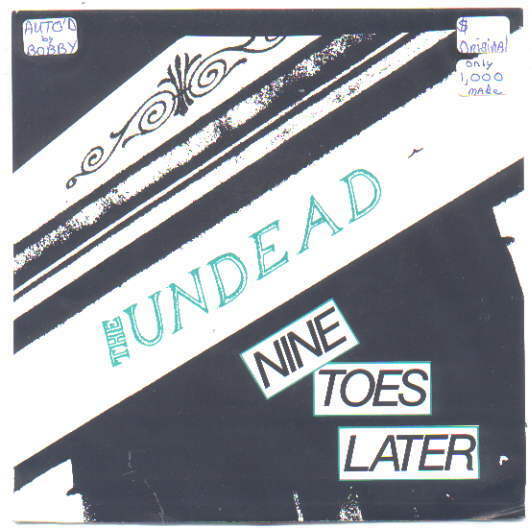 THE UNDEAD 45 record called 'Nine Toes Later'. Contains the songs: "Life Of Our Own", "My Kinda Town" b/w "When The Evening Comes", "I Want You Dead" on black vinyl. ORIGINAL pressing of this 7" record featuring Bobby Steele. Great condition from 1982 on Post Mortem label. Back cover is AUTOGRAPHED by Bobby in black sharpie. Only 1,000 MADE! Hard to find!! I bought this from Bobby himself in 1990 (he also sold me a test pressing of this release too). THE UNDEAD appearance in FLIPSIDE Magazine from Winter 1989! It is AUTOGRAPHED by BOBBY STEELE & TIM TAYLOR twice each, in purple paint markers! 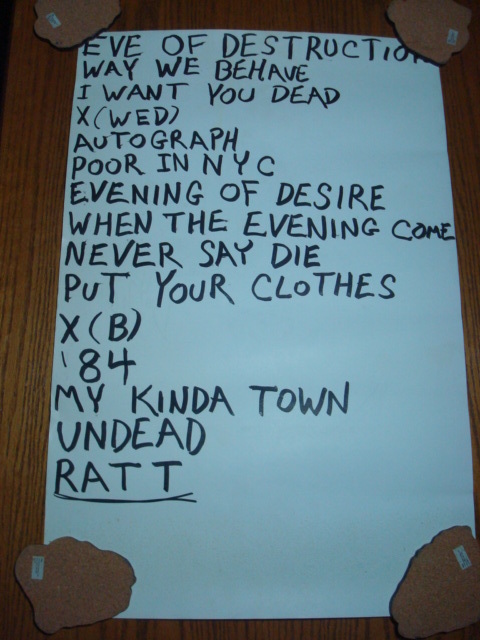 THE UNDEAD Hand Written Set List by Bobby Steele from a 1989 gig! Size is 17"x25". From my personal collection. The real thing. The other side is the Never Say Die Promo Poster & is AUTOGRAPHED by BOBBY STEELE in Black marker on back! Awesome piece to frame! 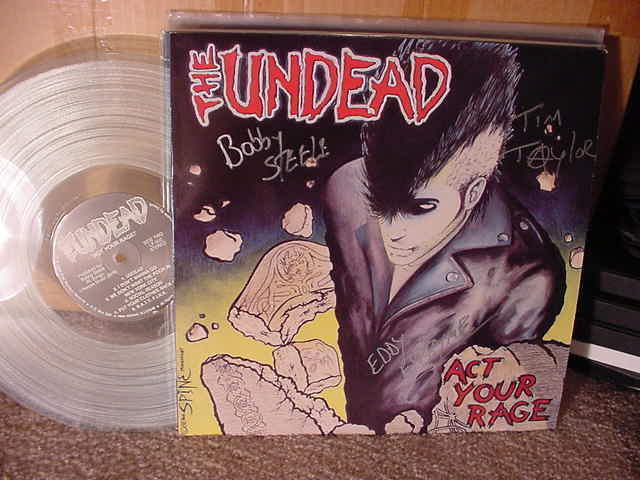 The UNDEAD "Act Your Rage" 12" vinyl LP - from 1989. It is Autographed on the Front Cover by BOBBY STEELE, EDDY ENZYME, & TIM TAYLOR in silver paint marker!!! Best of all - It is on CLEAR Vinyl & there are Only 100 Made in the world!! SUPER RARE! How many you got? Mint condition. 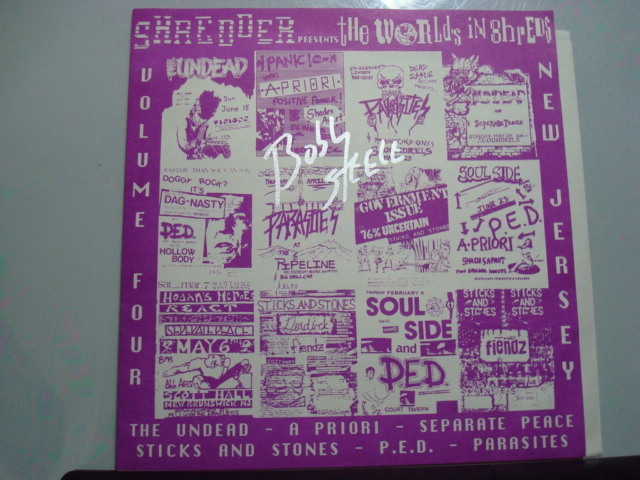 And it is Autographed again on the lyric sheet by BOBBY STEELE, EDDY ENZYME, & TIM TAYLOR in purple paint marker!!! 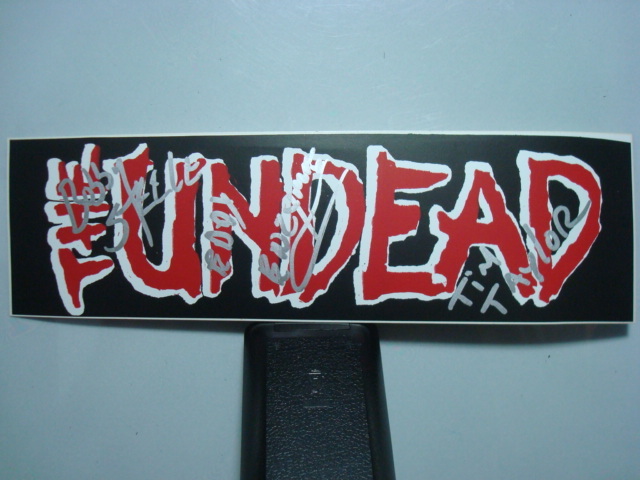 THE UNDEAD red 1989 Tour Sticker. Size is 9"x3". 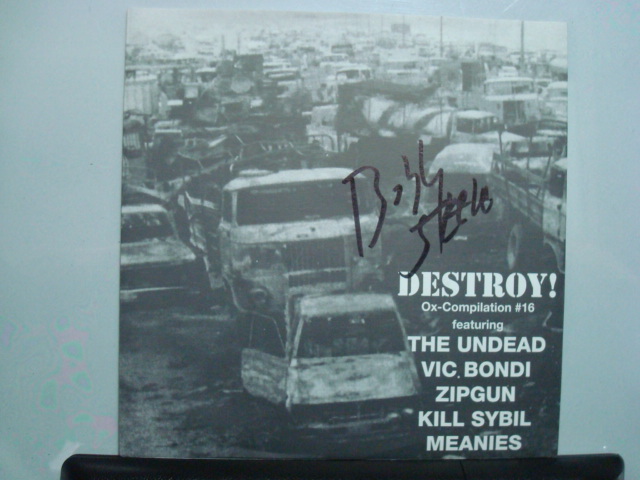 It is AUTOGRAPHED by Bobby Steele, Eddy Enzyme, & Tim Taylor in silver marker! 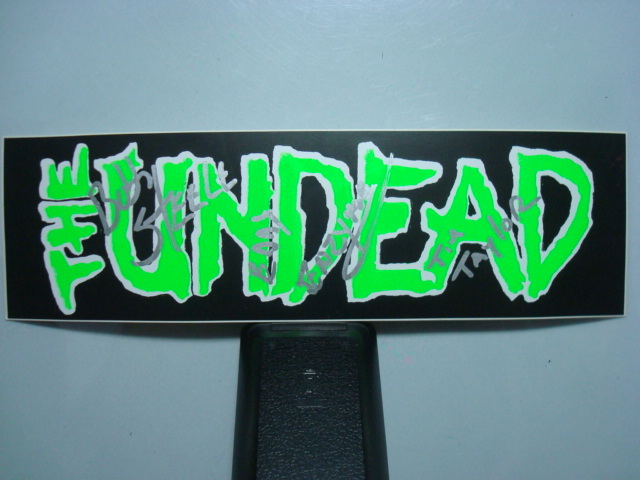 THE UNDEAD green 1989 Tour Sticker. Size is 9"x3". It is AUTOGRAPHED by Bobby Steele, Eddy Enzyme, & Tim Taylor in silver marker! THE UNDEAD 1989 Tour Detroit, MI Stage Used Drumstick. 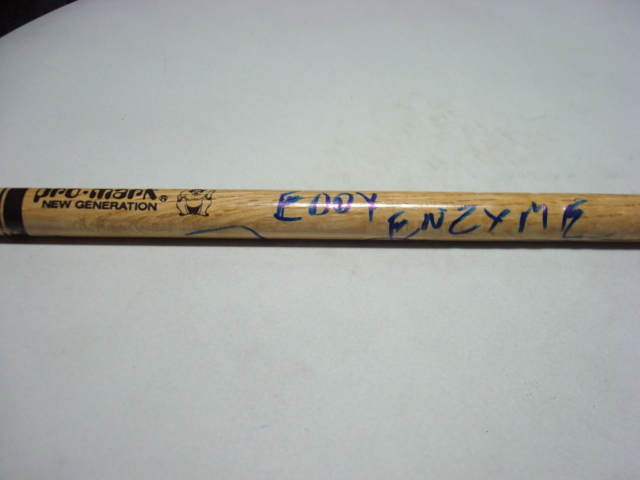 It is hand AUTOGRAPHED by Eddy Enzyme in blue marker!